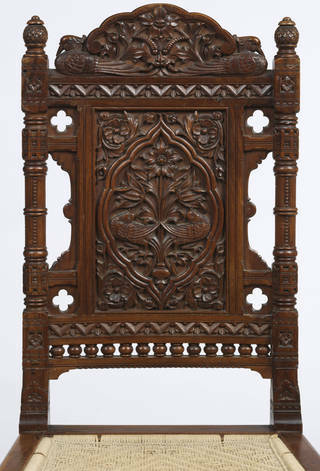 This elaborately carved side chair, designed by John Lockwood Kipling (1837 – 1911) and Bhai Ram Singh (1858 – 1916), reveals an unusual fusion of British and Indian styles. 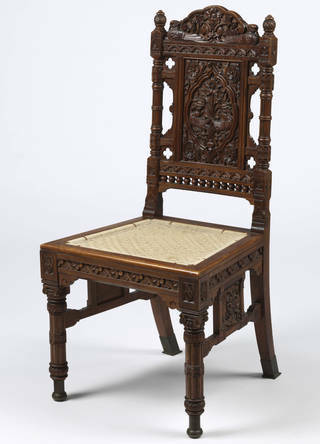 The side chair, designed for the billiard room at Bagshot Park (royal residence and current home of Prince Edward, Earl of Wessex and the Countess of Wessex), has a traditional early-19th century English shape, but is made, rather unusually, from 'padouk' – a timber native to tropical Asia and Africa. Richly carved with a variety of stylised floral imagery and birds, the chair’s design evokes the Arts and Crafts designs produced by William Morris (1834 – 1896), for whom nature was the primary source of inspiration. However, when observed more closely, the influence of the Punjab becomes apparent. 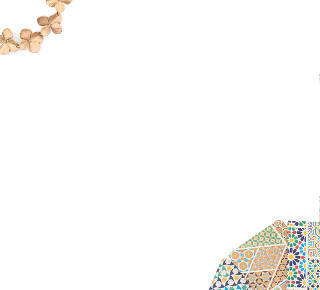 In amongst the scrolling vines and leaves, the lotus flower is a recurring image. This flower has sacred resonance in India, appearing in art and mythology as an auspicious symbol often associated with beauty and purity. Fantail pigeons, native to India and Pakistan, can also be seen roosting among the foliage. In the most striking divergence from this seemingly typical Arts and Crafts design, is the appearance of an ancient Indian symbol – the Kirtimukha or 'mask of victory'. The Kirtimukha is the face of a fanged and horned monster with bulging eyes that is believed to have the power to ward off evil. This is an unusual use of the symbol as a decorative feature for furniture, its presence more frequently represented in Indian temple architecture and jewellery. This chair was one of a set, originally commissioned to be 'of Indian design adapted to European comforts'. The furniture, designed as part of the broader decorative scheme for the billiard room at Bagshot Park, was commissioned by the Duke and Duchess of Connaught (Queen Victoria’s son and daughter-in-law), who had met Lockwood Kipling several times on their trips to India. 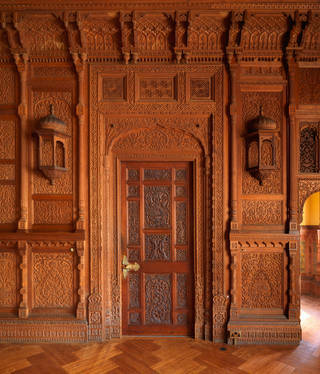 The Connaughts were clearly fascinated with the woodwork they had seen in the Punjab and that produced by the Mayo School of Industrial Arts, Lahore, of which Kipling was the Principal (1875). The billiard room, a new extension to Bagshot Park, provided the opportunity to bring this craft to a British domestic context. 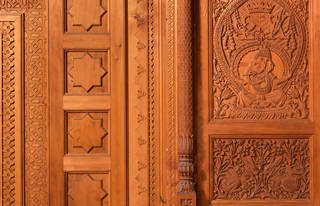 This was a unique undertaking in adapting an Indian craft and aesthetic to British form and functionality. Kipling used the Bagshot Park commission to promote Punjabi wood-carving, as practiced by his students. Woodwork at the Mayo School was one of the key crafts Kipling advocated and focused on developing (to the detriment of other regional craft practices), and this royal commission was a means to showcase the standard of the design and execution of woodwork by the School. Ram Singh, a Master at the Mayo School, also made designs and drawings for the wood panelling that still decorates the billiard room at Bagshot Park. Each of these 241 wooden panels were individually carved by Ram Singh, students of the Mayo School, and carpenters in Amritsar, and contain an intriguing mixture of British and Indian imagery, with rabbits and woodpeckers depicted alongside elephants, peacocks and turtles. 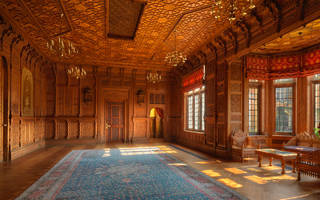 This unique fusion of British and Indian imagery within an Arts and Crafts design aesthetic at Bagshot Park also inspired Queen Victoria, who never travelled to India, to commission her own Indian-style 'Durbar Hall' at her summer house, Osborne on the Isle of Wight. Kipling and Ram Singh designed this room using similar imagery, though the Hall was decorated in plaster cast in London to save both costs and time. While these Indian-style rooms were greatly admired by the British aristocracy, only a handful of similarly inspired designs were commissioned for stately homes around Britain. However, this hybridisation of Indian and European styles was a lot more common in the architectural design and decoration of princely palaces being built in India in the second half of the 19th century.